Eleven years ago, Sheila first arrived at the Lakes Area Nourish Food Bank in Lakewood as a client. 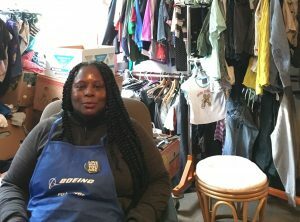 She experienced homelessness for about five months, until she got into an apartment. The food bank helped her get back on her feet. Since that first visit to the food bank eleven years ago, Sheila has been coming back to volunteer. She now volunteers twice a week for a few hours each visit. She does a little bit of everything at the food bank, but she mostly helps with their small clothing bank there. She sorts donations and gets them organized for the clients. Join Sheila and visit our Volunteer page to sign up.